Let’s be right up front and acknowledge the one drawback. Round Crystals roll far on hard surfaces if displaced from the litter box by a playful cat. A litter mat placed outside the litter box greatly minimizes this roll. Many inexpensive litter mats are available on Amazon or at your local pet store. In most cases, pet cats are almost completely indoor animals. Over time, their pawpads adjust to soft carpets, sofas, beds, etc. Round shaped crystals are much more comfortable for cats, especially kittens. Many crystal litters now claim 99% dust free. Give me a break. Dust is virtually weightless, 1% of 8lbs is about 1.3 ounces. This is enough dust to gag an elephant. Many of our customers choose Round Shaped Crystal Litter primarily for the almost complete absence of dust. Healthier for you and your cats. (Yes, there are trace amounts). The ideal spherical shape does not break down quite as quickly as the irregular shaped. In part, this is because the irregular shaped crystals are crushed into smaller pieces, then sorted and sized. The Round crystals are produced by a different method which does not involve any fracturing of the original product. It costs more to do it this way, but it produces a superior longer lasting virtually dust-free crystal litter. ROUND shaped is available by the case (4 Lb. bags only). SWITCHING: On rare occasions, a cat may be tentative about switching. 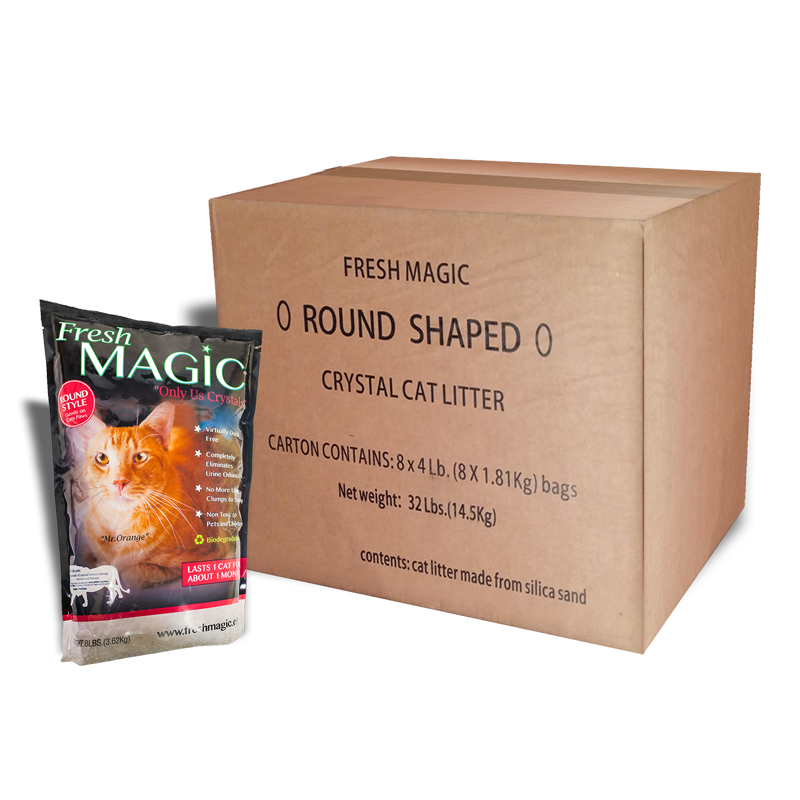 In this case, mix small amounts of Fresh Magic® crystals with the old litter, then increase Fresh Magic® crystals gradually while decreasing the old litter.